Click the links below to download images individually or scroll down to see them in their entirety. See the Kickstarter page here! When selecting FETs, there’s more to consider than the voltage and current ratings. How much power a FET can output is limited by how much power the FET itself can dissipate. Fortunately, this isn’t difficult to determine for simple low frequency applications. RDS(on) – “on” resistance of the FET given a known VGS value. RθJA, (or RthJA) – Maximum Junction-to-Ambient temperature in °C per watt of dissipated power. First, find your load’s current requirements at a given voltage, (the voltage of your main power supply), if you don’t already know. Measure it’s current with a multimeter or calculate it using Ohm’s Law. This will be your drain current, or ID. Second, determine your RDS(on) value based on your desired or applicable VGS voltage. You may want to increase this value by about 10% or more to account for error. However, at 175°C, not only is it well above the boiling point of water, but will cause the RDS(on) resistance to increase, which will increase the power dissipation, which will increase the temperature, etc. This causes thermal runaway and will likely end the life of your FET prematurely. 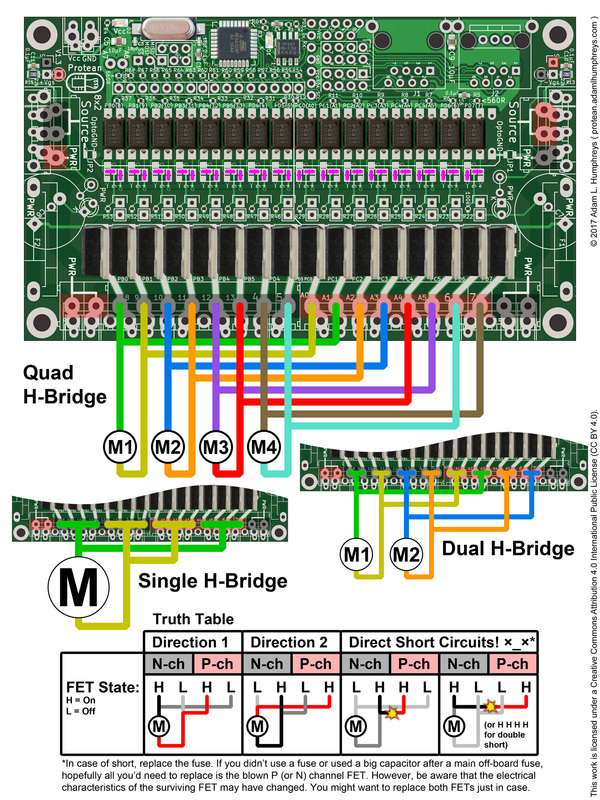 This is why it’s important to choose the right FET for your application and test! When configured as an input, OptoGND must be set with JP2 or JP1. If N-channel FETs are present, set JP2 to connect OptoGND to the common low/ground side on N-ch FETs. 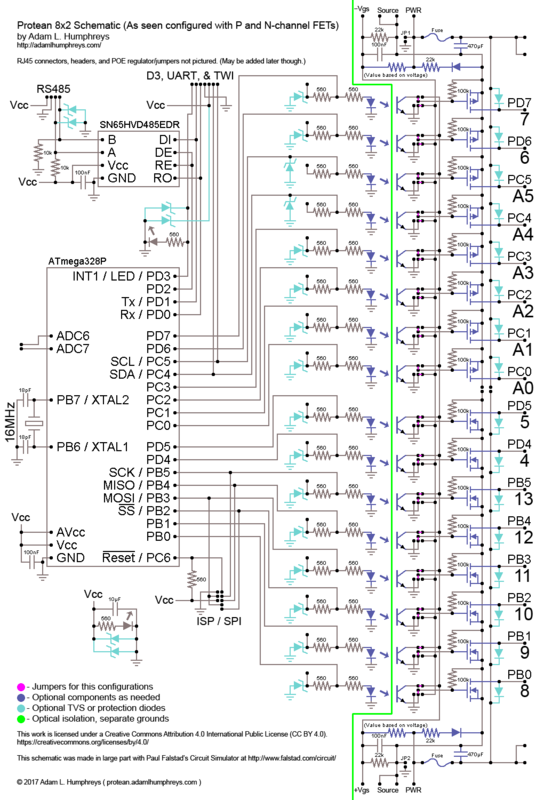 If only P-channel FETs are present, set JP1 to connect OptoGND to the common low/ground side of loads. Optocoupler is horizontally flipped and mounted on underside side. Optocoupler is rotated 180 degrees on top, straddling across two channels. 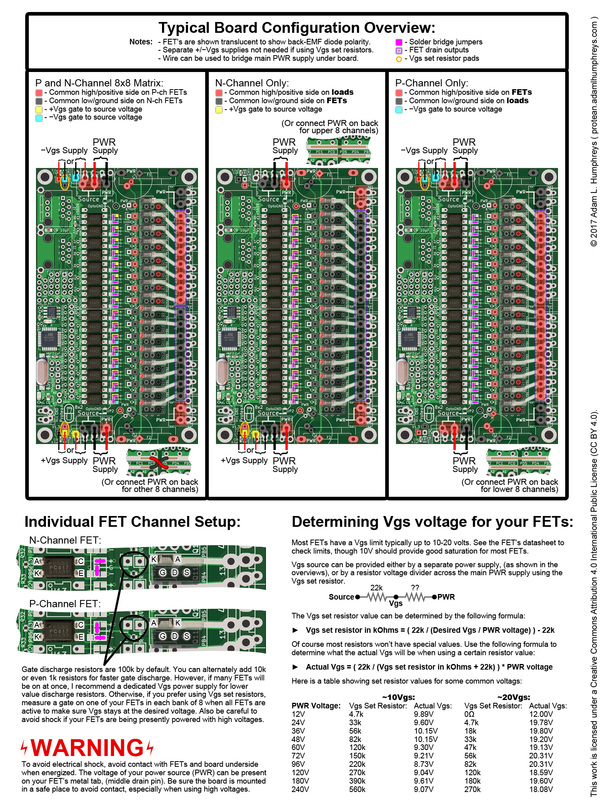 With this configuration, the channel above must be configured the same way or remain unused as a FET output. 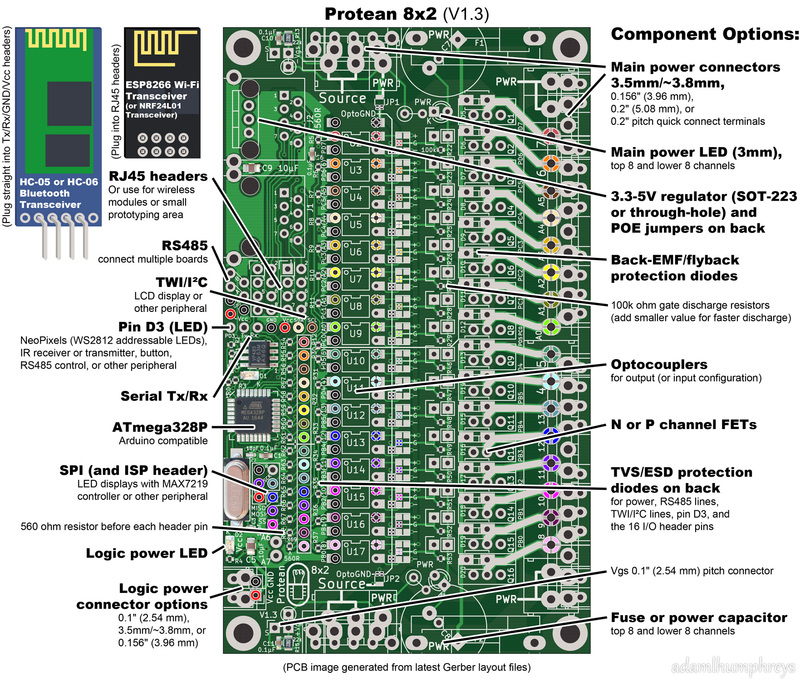 The top-most channel remains unaffected and the cathode will already be connected to ground as indicated by the silkscreen. If the nearby FETs of the nearest 8 channels are N-channel, (i.e. the Source is ground), the resistor circled in black doesn’t need to be changed. A resistor will be needed on the pads circled in green though, and it’s value and power rating can be the same as that needed for the PWR LEDs depending on your positive input voltage. Your input voltage on the main channel pin can be either your main power supply or your +Vgs power supply, (if you’re using a separate supply). When the optocoupler is on, you will read a low signal on the logic side as you would a pressed button and a pullup. 1. Remove the surface mount resistor circled in black and add a resistor on the pads circled in green as you would for the optocouplers near N-channel FETs, (as previously described above). 2. Use a resistor on the pads circled in black. It’s value and power rating can be the same as that needed for the PWR LEDs and will turn on the optocoupler. It will essentially serve as a pullup resistor. Jump the pads circled in green with a wire or solder bridge. Driving the main channel pin low will yield a high on the logic side as an unpressed button and a pullup. This work is licensed under a Creative Commons Attribution 4.0 International Public License (CC BY 4.0).